It’s has been nearly a year since my visit to a Chinese restaurant and writing my first blog on this Asian cuisine. I had resisted for some time since starting my blog due to the fact that I was raised on top quality Chinese food in Southeast Asia, and most of my experiences in the DC area with such Far Eastern offerings have been sub par and rather disappointing. But I must admit that I quite enjoyed my experience at Bob’s Noodle 66 (read blog), and enough time has passed by for me to recover from one of the most challenging culinary concoction that has ever traversed across these taste buds – Stinky Tofu. A few weeks ago, I headed up to Rockville, MD, an area that I usually avoid due to the traffic congestion and the equally packed streets with businesses that vie for one’s attention. But the area has a high Asian population, and there are many eating establishments that cater to their gastronomic cravings. So when I picked up a friend for dinner, I suddenly remembered about a place that had rave reviews for their authentic Chinese fare especially their Szechuan dishes. 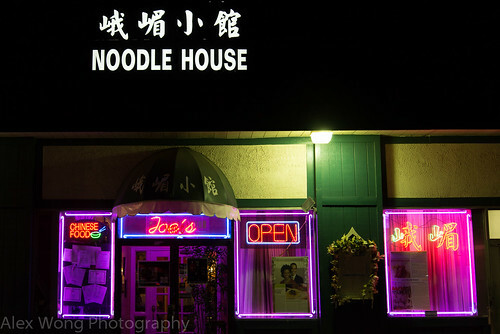 Being a man of travels, my friend agreed to this culinary adventure with me, and we trotted into Joe’s Noodle House. Upon walking into the restaurant, you sense its immediate funkiness indicating a level of authenticity that spells food-for-the-recent-immigrant. After being shown to our table, we had to place our order at the front cashier counter. Next to it is a refrigerated display case filled with various side dishes that peak the curiosity of the diner staring at the not-so-familiar dishes. 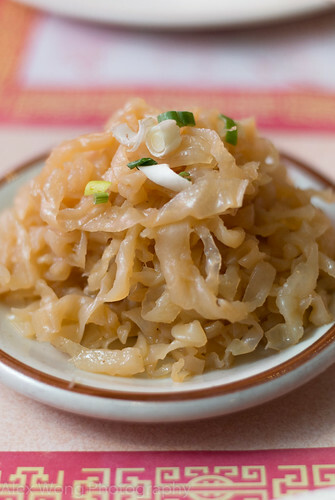 I immediately recognized an offering that I had not eaten in a long time – Jellyfish Salad. One can easily mistaken the semi-translucent strands as some noodle dish, but knowing what it was, I immediately grabbed it. The long strands were a bit bouncy, slightly crunchy, and at the same time silky smooth. It had quite a bit of salt that this seafood calls for with a good hit of sesame oil that brought some rich nuttiness to each sliver. The bits of green onion added a hint of pungency to this mild dish. I really enjoyed this rare opportunity to savor this small side dish, and it was a delicious opener to the meal. My dining companion and I could not resist ordering a couple more side dishes. My friend’s order was Spicy Chicken Gizzard. Cold pieces of cooked chicken gizzard were cooked in some chili oil exuding its piquancy to each bite. 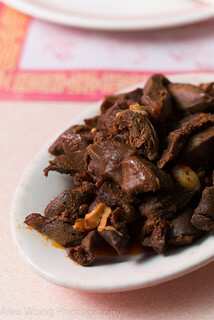 A level of dark spices, most likely Szechuan peppercorn, left its woodsy trail after each bite, along with a slight mineral-like quality that this organ meat possesses. However, he was not used to a gizzard dish served cold, but I was intrigued by its flavors especially the unique Szechuan spice. Another order was Spicy Sweet and Sour Cabbage. 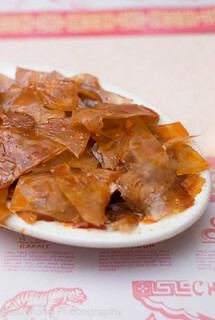 Pieces of pickled cabbage were both sweet and slightly sour with each crunchy cold bite. It was definitely more sweet than sour without being cloying. Hints of fresh ginger punctuated these bites which made it more interesting that its simple appearance – a delicious hit for both of us. For the main course, my order was String Beans Szechuan Style with Pork. 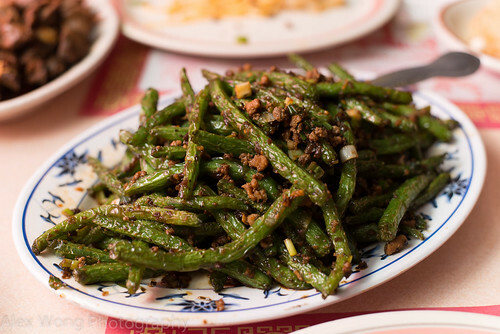 Judging by the wrinkly exterior, whole string beans have been flash fried in searing oil that cooked them through while maintaining their slight natural crunch. The savory and garlicky sauce was a salty complementary foil to the natural sweetness of the vegetable which made this flavor combo completely irresistible. The small bits of pork were well seasoned and spiced with some Szechuan peppercorn that turned them into a tasty flavoring element, which meat serves as in most Chinese dishes on the mainland. I enjoyed my leftovers the next day and I still marveled with each mouthful of the string beans with its salty-sweet combination. A vegetarian version is also available and I’m quite sure that it is equally tasty. 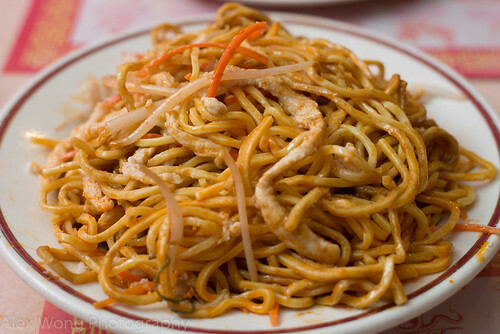 The other main dish was a house specialty – Dan Dan Noodles. 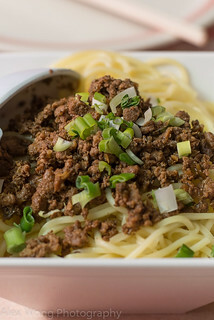 A bowl of ramen-like egg noodles arrived topped with bits of spiced pork and some green onions. As we started to pick at the noodles, our waitress quickly advised us to give it a good mix and warned us that it would be too salty if we didn’t heed her advice. So, we gave it a good mix, and underneath that unassuming mound was a pool of chili oil that tainted the whole bowl like bloody murder. 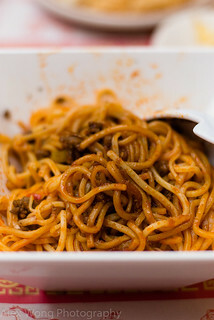 The noodles were spiced by the red oil made interesting by the pork bits that have been made fragrant by the Szechuan peppercorn that seem to transubstantiate into something that belied its porcine nature. We both enjoyed this dish a lot, and now we know why this dish was highly recommended by the Washington Post food critic – good call, Mr. Critic. On another visit with a longtime friend, we choose a couple of different side dish starters. 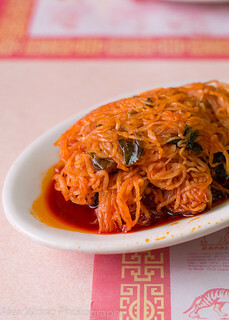 Shredded Radish with Hot Sauce was our first order. 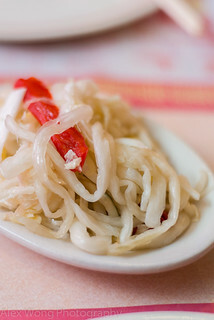 Thinly julienned Daikon radish have been pickled in a sweet and sour solution made red by a pool of chili oil. This was a bit funky for me since I was slightly put off by the amount of chili oil used in the dish, which I kept draining off each chopstick full of the vegetable – I have heard a fair deal of complaints of oily dishes in mainland China and there is no exception in this establishment. The other side dish was Beef Tendon in Hot Sauce. This was also a funky cold dish that I warmed up to after a few bites. Pieces of cooked beef tendon were slightly chewy yet quite flavorful made by the Szechuan peppercorn and chili oil. What I liked about this dish was its off-the-beaten-path character that transported me to rural China where tendon is a major source of protein, alongside its slightly funky texture and interesting flavors. My friend’s main course was from its vegetarian menu – Eggplant with Basil in Garlic Sauce. 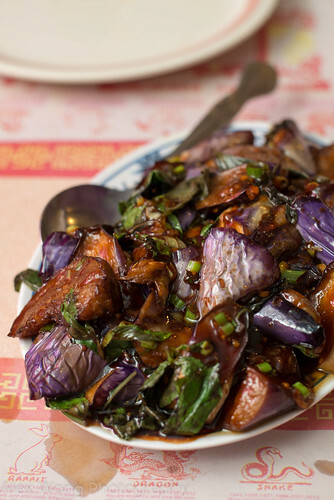 Pieces of Asian eggplant have been flash fried and paired with basil leaves cooked in a brown garlic sauce. This was quite tasty with the vegetable made soft from the frying and fragrant from whole pieces of basil leaves. The brown sauce was very savory made tastier by a good hit of garlic. However, being an eggplant dish, it was quite oily for my taste but I was quick to overlook the downside of this dish after a few bites. My lunch order was another noodle dish that caught my attention on the previous trip – Spicy Cold Pasta with Sesame Sauce and Chicken. 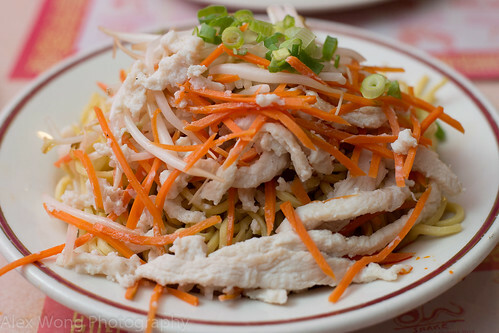 Cold egg Lo Mein noodles came topped with julienne of carrot, beansprouts, and strips of boiled chicken. Having learnt from my last trip with the other noodle dish, I give the dish a good mix to reveal the sesame sauce under the pile of pasta. The thick strands of pasta were enriched by the rich nutty sesame sauce mixed with chili oil and made less stodgy by the fresh vegetables and the cold chicken. This was a quickly filling dish due to the thick pasta and rich sauce, which could have done with a hint of acidity to lighten the mouth feel and flavor (my Southeast Asian gastronomic conditioning kicking in here). However, I found it quite enjoyable and authentic, and I was soon happily slurping the noodles away.